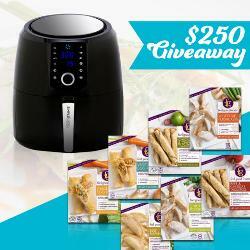 Contest: THE FEEL GOOD FOODS & AIR FRYING ULTIMATE GIVEAWAY. THE FEEL GOOD FOODS & AIR FRYING ULTIMATE GIVEAWAY. Prize: The approximate retail value of all prizes is $149.99. The prizes are: Simple Living Products XXL Digital Air Fryer.